As is often the case I suppose when you move into a new home, especially one that you own, there are a number of things you have to sort out once you settle to make sure that everything is as you wish. For us, that involved getting all three bedroom floors sanded and polished. Not you’re your average domestic job polish though, no. Not even your commercial business grade polish was going to grace our floors either. If you are going to get something done properly, you reasoned that you may as well go the whole hog and therefore we got the industrial strength polish that you put on basketball courts! Which wasn’t actually a problem. I didn’t have a preference one way or the other. The issue only came when we were deciding what to put on said floors and more to the point, when. Can I just say dear husband that this was the most um…precious…that I’ve ever seen you. Not even for the wedding did you fuss over one single thing as much as you’ve fussed over those floors. And it didn’t let up. During our first couple of days living in the house I heard “have you been taking your shoes off before walking on these floors” which sounds remarkably like a question (if you were to put a question mark at the end of it that is) but you had more of an exclamation mark really which made it what you thought was a cunningly disguised “I can’t believe you’ve been walking on those floors in your shoes – I hope you haven’t ruined them”. Then, when I was finally given permission to put furniture in direct contact with the floorboards, especially in the spare bedrooms, there were a number of variations on a theme. “Have you put felt on the bottom of that stand?”. “I hope you’re padding all the legs before you put them down”. “Make sure you’re protecting the floor from the end of that power cord so it doesn’t make scratches”. I swear, you had me figuratively and literally tip toeing around the floorboards! And then there was the time you walked up the hall and said “you’re not planning on putting rugs down in those rooms are you”, fully assuming that my answer would be in the negative and your coveted floors would remain untainted by the smothering nature of the common rug. Unfortunately for you my answer was not “definitely not, I would never cover those beautiful floors” but more a “duh, of course I am”. What did you think I was going to do with the rug that we already own? Were you not listening to any of the conversations we had where I said floorboards make the rooms too cold in winter when they’re not covered? Did you not listen when I repeatedly said that I prefer to have carpet or some sort of covering underfoot rather than bare floorboards? Evidently. I agreed to get floorboards in the house only in the bedrooms because I knew I wouldn’t spend most of my time in the house living on them. I go to our bedroom to sleep and I am far less likely to spend hours in the spare room (which is currently our wardrobe) or the study (which has no power points and therefore no heater). I suppose in summer that I would be open to removing any rugs to the garage but I thought you’d like that rugs in the house would be protecting the floors. Or were we only supposed to protect them for the first couple of weeks and after that they can get scratched without impediment by normal wear and tear? So the floors have been a bit of a touchy (or perhaps that was No-Touchy!) subject. There were a few other things however that ended up being more hassle than they should have been like the laundry taps. Now unfortunately for us, our laundry taps leaked. Not your slow, dripping kind of leak however but as you were aware, more of your turn-your-back-for-an-instant-and-we’ll-flood-your-laundry-AND-your-kitchen kind of leak. There was no way we were hooking up our washing machine without the assistance of a plumber. So you called around. You’re a big believer in the whole “there must be someone who can do it cheaper” mentality so you researched our best option. Now I don’t have any issue with this. I like saving money. I also however like clean underwear. I think I asked you a couple of times over the first week if you had found someone yet and eventually you replied with something like “oh yeah, I found someone the other day who could do it – did you want me to go ahead and book the job?”. Is the Pope catholic? Of course I want my laundry taps fixed. And does it really matter what time the plumber comes over? Damn Skippy it does if its going to be any time up until the end of the weekend. The whole point of getting them fixed is so that I can do the washing so yes, book the plumber because clearing our laundry baskets is not really a half hour type of job. In the end it was like a several hours type of job but then, O the Joy, I have a clothesline!! That weekend I think I was in love with our clothesline. You thought I was weird and the neighbours thought I was nuts but you don’t understand because I don’t think you’ve done more than three loads of laundry in the last three years. When I wash things now, I can get them dry in the sun. I don’t have to cram king bed sheets into the dryer and wait for ages while the exhaust results in tropical rainforest conditions in the laundry making it appear that the walls themselves are perspiring before permeating the rest of the unit with a dampness that I’m sure wasn’t healthy. This whole having a clothesline that sees direct sun for hours on end thing is awesome. Simple things amuse simple minds I suppose. Which is why we’re so perfect for each other. Every so often dear husband, you come out with a pearler. I remember when we first started living together, we had a quote wall in the house and many of the sentences on there were yours. When you are relaxed, you rarely hold back but now that we’ve been married a while it seems there is a whole new level to what you are quite happy to let hang out there. On this particular occasion I was trying to get to sleep but every minute or so you would vigorously scratch your scalp which, during the quiet of the evening when most of the lights are out and everything else that makes noise (apart from our ancient fridge) has been turned off, is irritatingly noisy. Since my patience has plenty of bounds when I am trying to get to sleep and you were really ticking me off I told you sternly to stop scratching as it was too loud. You immediately rolled over to face me though and with the most innocent and earnest of looks on your face you told me no…“my scratch is really quiet, much like my farting”. Other than that, this month you also celebrated a birthday. As per your request, it was with little fanfare (which was allowed only because your next birthday is a milestone birthday). I figure that any birthday ending in “0” deserves something at least a little bit special. Although there was still a sort of party since you happen to be born on the same day as one of my cousins who was celebrating her 21st that night. I do thank you however for giving up your birthday dinner so we could go and wish her well. And the final thing that it would be remiss of me not to mention is that this month you became no longer employed. The corporation finally got their way and after setting you up with every KPI they could possibly think of that fell within the bounds of “legal”, they got to pay you out with four weeks notice because you didn’t meet their wildest expectations. The fact that you still did the job better than most of their remaining employees who can’t meet those KPI’s either was not the point. Their other employees didn’t ask questions (and probably brownnose a little more) so they are apparently more fun to have around. This means that you are currently looking for work again which I must say, fills me with mixed emotions. I know that your previous job was a bad fit for you and you were really unhappy. I can see how much more relaxed you are now that you have that weight off your shoulders which is great. On the other hand however, we have just signed a mortgage (and as luck would have it fobbed off all the attempts to sell us income protection). We’re not in dire straits or anything yet by any means but we can’t afford to live on my salary alone and I’m concerned that things are going to get worse before they get better. You are confident that you will be able to walk into something within a couple of weeks (and if you didn’t care what you did, I’m sure you could) but we both want for you to find something you want to do and last time, that took a little longer. I hate to be a glass half empty kind of wife but you have never suffered fools gladly and that doesn’t seem to leave a whole lot of other options out there. I’m trying to have faith and be supportive though, really, I am. On the plus side though, now that you’re not starting work at stupid o’clock in the morning on the other side of Sydney, I get to wake up later and I have also been able to receive a lift to and from the train station each day. You have been waking up each morning with me and throwing on a jumper and ugg boots before getting in the car to drive me so I don’t have to take the bus. The fact that you’re still in your PJ’s is not a big deal because hey, you’re not getting out of the car till you’re back home and your PJ’s look kind of like casual clothes anyway (at times, they probably are). No one else has to know. I had to smile the other day however because when you dropped me off, the lady driving the car in front of us got out to kiss her son goodbye…in flannel pyjamas, velvet slippers and a polar fleece dressing gown. We’re sure living in the west now baby! You keep telling me that you had no idea before we got hitched that you were marrying such a bogan so I tell you this, I promise that if I ever have to drop you at the train station at 7am in the middle of winter, I’ll leave my terry-towelling robe at home. 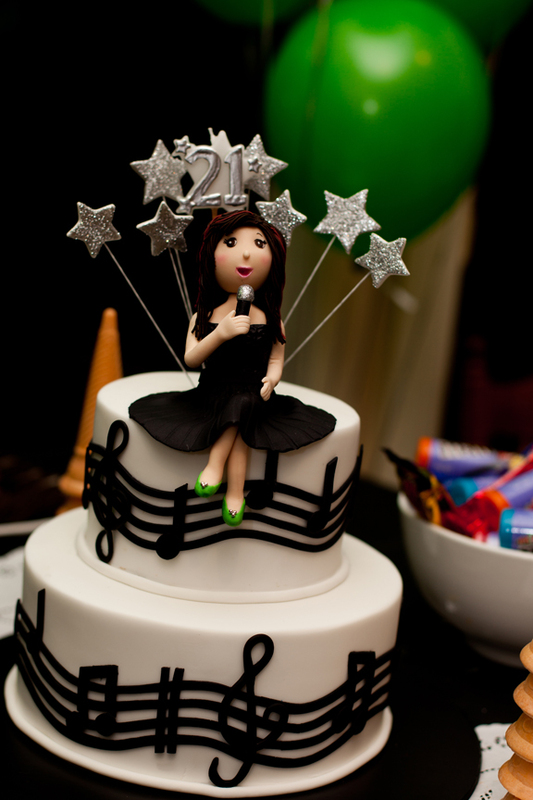 * Photo of the cake that my cousin wanted for her 21st. Not quit what I would have chosen for you dear but it tasted nice!